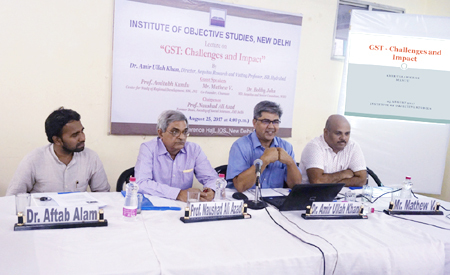 The Institute of Objective Studies (IOS) organised a lecture on “GST: Challenges and Impact” on August 25, 2017 at its conference room. The lecture was delivered by the Director, Acquitas Research and visiting professor, ISB, Hyderabad, Dr. Amir Ullah Khan, who traced the history of goods and services tax in India. It was the ex-Prime Minister, VP Singh, who first mooted the idea of a uniform goods and services tax in the country. Later on, Prime Minister, Atal Behari Vajpayee set up a committee to go into the issue. The UPA government also deliberated on the GST, but it was vehemently opposed by the then chief minister of Gujarat, Narendra Modi, now the most vociferous proponent of it. He said that the industry wholeheartedly supported the BJP during the parliamentary elections of 2014 in return for the promise to annule the land acquisition law. In order to keep the promise, the Modi government tabled the first resolution in 2014. Since several BJP members of Parliament opposed the move, the government shifted its focus to GST in order to benefit the industry. Dr. Khan observed that the BJP was working on a policy to instal a BJP government in every state, so that the GST law could be easily approved by state assemblies. He said that the purpose behind bringing in the GST law was to enforce the principle of one country one tax. The rate of GST differed from item to item. Some items had 5 per cent tax while other had 15, 18 and 28 per cent tax respectively. He wondered that despite being the largest industry, petroleum and construction sector were exempted from the tax. He noted that the ill-effects of the GST had started appearing as jobs in sectors like tourism, construction and others were vanishing. He said that against the requirement of 10 lakh jobs every month, only 1,25,000 jobs were made available in the last one year. GST had not yielded positive results as was visualised earlier, though it had changed the face of several economies in the world. Dr. Amir Ullah explained that earlier there was no uniformity in taxes on various items. States used to charge their own taxes on items which varied from state to state. In the present case, there was no duplication in taxes. He said that when a commodity was disliked or there was a move to phase it out, the government indirectly placed restrictions on it. Sometimes a commodity was highly taxed so that the consumer desisted from buying it due to high price. He pointed out that GST roll-out had begun. The idea was that it would simplify and harmonise taxes as much of the “tax terrorism” that existed in India would get extinguished. Even if it came at the cost of making India less of a federal state, it would be well worth it. But, he added, the beginning had been rough. Not only was industry unprepared, it was obvious that the government too was way behind on its preparations. The Telangana chief minister was the first to have realised that GST would cause distress. In a letter to Prime Minister Narendra Modi and the Union finance minister, the Telangana chief minister, K Chandra Shekhar Rao, sought exemption for the works covered under beedi and granite industries and works under irrigation and drinking water projects. KCR argued that thousands of workers were subsisting on beedi industry and imposing excess taxes on the industry would adversely impact them. Dr. Khan remarked that with more than 140 commodities that would have to be fitted into the five slabs, the tax department had its hands full. It had still not decided what to do with products where there was a need to fix special cesses on goods that were now capped at 15 percent for aerated drinks and luxury cars, and at 135 percent for paan masala, and 290 percent or Rs. 4,170 per 1000 sticks for cigarettes. He said that most items would fit into the existing VAT scheme. He held that at the moment, each state differed so much that the actual fitments would require intense lobbying by states. This would be followed by businesses that would start their own lobbying. This posed the danger of a return to the old system of business lobbyists using all possible means to get their products into lower slabs. The government had not yet been able to grapple with the demonetisation debacle. He believed that the government would have to work overtime to save itself from another embarrassment. 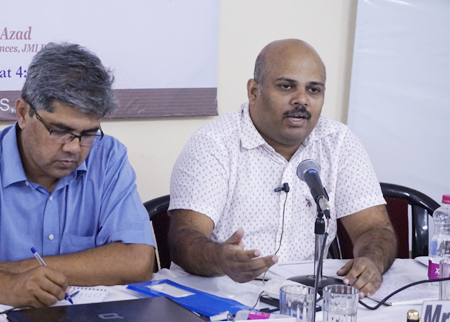 Co-founder of the NGO, Chunaav, Mathew V observed that while demonetising high-value currency notes it was stated that black money would be unearthed. It was also said that demonetisation would deal a striking blow to the funding of terrorism and help put an effective check on the menace of Naxalism. But, this was just a façade. The main purpose of demonetisation was to financially weaken the Opposition parties. And the BJP succeeded in this scheme. 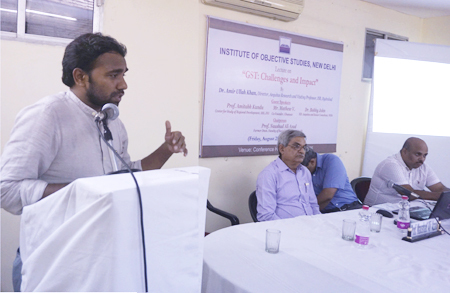 Presiding over the seminar, former, Dean, Faculty of Social Sciences, JMI, Prof. Naushad Ali Azad hailed GST as a good step to put the economy on a sound footing. Admitting that GST was not sending good signals for the present, he expressed the hope that good results would come out soon. 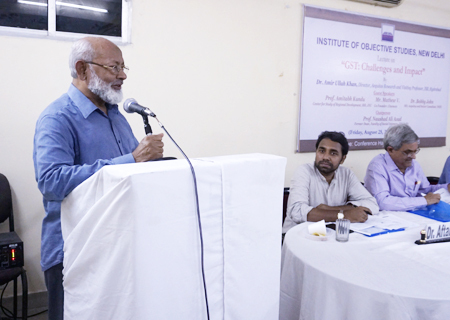 The chairman, IOS, Dr. Mohammad Manzoor Alam emphasised the need for assessing political and social impact following the enforcement of the GST. He insisted that petroleum was exempted from GST in order benefit a particular individual. He called for pondering over the impact of the rising prices on the poor after GST was implemented. Earlier, the seminar began with the recitation of a Quranic verse by Maulana Shah Ajmal Farooq Nadvi. Asstt. 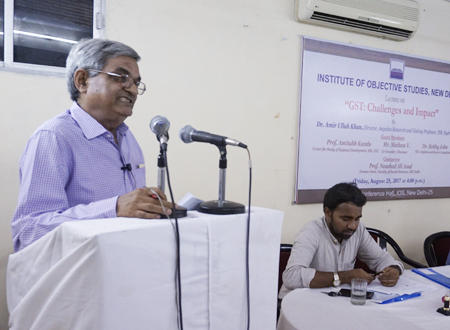 professor of political science, Zakir Hussain College, Delhi University, Dr. Aftab Alam, conducted the proceedings. 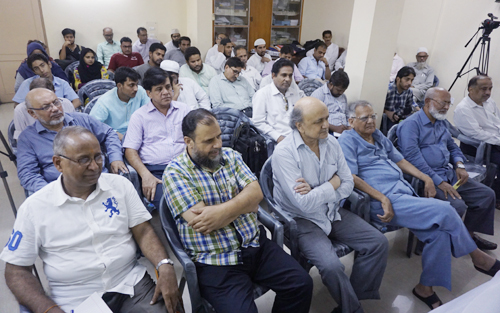 The programme was attended by university teachers, scholars, social activists and concerned citizens, including the secretary-general, IOS, Prof. ZM Khan and assistant secretary-general, Prof. M. Afzal Wani.